Having formed their duo in 1997, they’ve performed all around North America making lyrical and quirky music, but always crafted with great care and musicality. Part of their mission is to explore the sonic soul of urban junk — often repurposing found instruments as sound sources — interwoven with compelling storytelling with thematic roots sunk deep in the human condition. The Minden Hallett Duo has released several albums. Their last, What Is Your Name (2015), was arguably their strongest yet. In my April 2015 review, I suggested, “One way to experience What Is Your Name is as a sound film, or a kind of song cycle filtered through a … contemporary alternative folk ethos, though without the guitars, drum sets, pop musical vocabulary and studio production methods permeating the latter.” On Waltz, the last track, blown bottles provide the main melody and accompaniment. We hear common bottles again at the core of the duo’s latest release Flying Horses. Also in 3/4 time, the track conjures up the old-timey sounds, sights and feel of a 20th century amusement park. The whimsical-sounding single runs an unassuming 2:49, yet the musical forces arrayed in the studio by the two musicians are anything but modest. In Flying Horses sixty-nine blown glass bottles of many shapes and sizes form a remarkable “bottle choir,” complete with bass, tenor, alto and soprano voices in an uncanny imitation of a steam calliope, though in this case less industrial and more human-scaled. The cider, beer, sherry, vinegar, etc. source of the bottle array is lovingly illustrated on the duo’s blog post. As individually blown by the breath of the duo and meticulously multi-tracked in the studio, the bottle choir wistfully evokes old-timey fairground sounds. One benefit to using bottles for music: they can be precisely tuned with water. In Flying Horses bottles are tuned to a form of just intonation, minimising the beating between two or more notes, as present on the piano for example. The result is a pure, mellifluous and subliminally satisfying sound. A few phrases later Hallett’s French horn solo offers a three-note rising call in response to the bottle choir’s cyclical, repeating waltz. The music’s close is signaled by the harmonic cadence in the bottles, undercut by the wispy a-tonal glissando of the waterphone suggesting a transition to another, unknown sonic space. Could it be toward the next track in a new Minden Hallett Duo album? I hope so. Andrew Timar is a Toronto freelance music journalist, composer and musician. He is the founding editor of MUSICWORKS and has served as reviewer, columnist, blogger and features writer for The WholeNote magazine. Specialising in the music of Indonesia, Timar is a co-founding member of the Evergreen Club Contemporary Gamelan the first group of its kind in Canada. He is a leading soloist on the suling (Indonesian ring flute). I’ve reviewed dozens of albums of music in numerous genres, subgenres and cross-genres over the years, but the extraordinary What Is Your Name by Robert Minden & Carla Hallett occupies a particularly difficult to assign niche. The eleven tracks are all strictly speaking songs, but fall into two types. A storyline (Hallett’s lyrics crafted from her poetry and “childhood fragments”) runs through many of the songs, however a few use vocalise exclusively in a way which doesn’t appear to advance the primary narrative. The majority of the dozens of instruments played are “found sounds” made on objects not originally designed to function as musical instruments, a specialty of the Vancouver duo. On the other hand the most formal of instrumental furniture, the piano – both in its grand and toy varieties – also makes a significant contribution via Minden’s sensitive performances. The intimate near confidentiality of Hallett’s lyrics, singing style, and the delicate textures of the myriad instrumental sounds, all of which never appear to rise above a mf, are quite at home in my living room speakers. They would be out of place at large venues however. In other words they suit quiet intimate spaces, the way that Franz Schubert’s songs were enjoyed in private homes in the 19th century, or “story songs” in small smoky cabarets in the 20th. One way to experience What Is Your Name is as a sound film, or a kind of song cycle filtered through a rarified contemporary alternative folk ethos, though without the guitars, drum sets, pop musical vocabulary and studio production methods permeating the latter. Another way would be as a contemplative experience in deep listening as articulated by the composer Pauline Oliveros. It is worth noting here that the Toronto born, Vancouver based, Minden’s three decade career as an inventor, arranger and composer of music for found objects, the music director on five previous albums – the first, The Boy Who Wanted to Talk to Whales, was nominated for a 1990 JUNO – has not been well documented. Perhaps it is partly due to his musical approach, which privileged improvised music making and straightforward lyricism embedded in tonal song structures, as articulated through the Robert Minden Ensemble (1986-1996) and then the Minden-Hallett duo (est.1997). This aesthetic didn’t dovetail neatly with late 20th century academic or popular music norms. Moreover his performance energies were dedicated outsider instruments such as the musical saw, the waterphone (commissioning six from its inventor) and later the Theremin (he plays one signed by Bob Moog), as well as many a found object, lovingly sonified. This focus moved his first instrument, the piano, into the background, that is until it re-emerged at the heart of this album. The gently atmospheric Minden-Hallett songs on What Is Your Name were painstakingly arranged and recorded in no less than five Toronto, Vancouver and Banff studios. 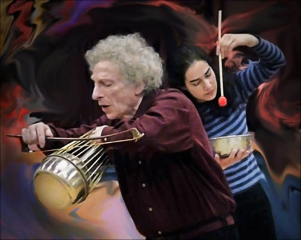 Dozens of instruments contributed to the album’s rich timbral palette, all played by the duo. The opening story-driven The Waiting Room is a good example of their exquisitely mixed and layered instrumentation. And how can you not warm to a song whose refrain is a reiterated “Saskatoon…” underlined by the musical saw? Words Never Spoken features the sounds of some 19 different instruments (I counted), yet none found in conventional orchestral or vernacular music. They include many types of unconventional tuned percussion like clay flower pots, steel bowls, glass bottles, but also a “string box,” a “whirly” and a “blown tuned cider jug.” It’s all annotated in the detailed liner notes. Clearly the source of the sounds they make is of prime significance to the duo; despite these instruments’ humble everyday origins, when repurposed to produce music they reveal a process of magical transformation, a form of instrumental wabi-sabi aesthetic. Moreover, another reveal is the emotion felt by both musicians and listeners directly conveyed by sounds produced physically in the acoustic realm, unmediated by electrical currents which add their own subtle flavours. The Courtroom is a mini drama with both spoken and sung narrative by Hallett and richly textured instrumentation evocatively scored by Minden. The initially hummed modal melody is extended by the addition of a broken chord accompaniment on a Steinway grand, evoking the spirit of certain works by Erik Satie. Are You Now (remix) again features a piano backbone, revealing yet more glimpses of what sound like a nod to Satie’s minor modal harmonic palette, plus a very convincing blown-bottle bass line. In several songs, including Little Green Secrets, I hear echoes of the melodic, harmonic and lyrical touches of Leonard Cohen. Other songs like Blood Stranger feature Hallett rendering a haunting recitative with echoes, perhaps, of Gregorian chant. Reflection is another modal melody anchored by a simply constructed piano accompaniment realised in a beautifully modulated rubato by Minden. It sounds eerily like a lost Schubert song piano part re-interpreted by Satie, and then in turn by John Cage (I know, I’m stretching here but those layers are present). Hallett’s spare vocal performance with only the gentlest of vibratos is emotionally touching yet devoid of sentimentality. The vocal melody’s restricted range and one tone per syllable text setting conjures up a sere mood. Despite its aphoristic length, this 2:32 work is among the most complete musical statements on the album. Reflection is a perfect marriage of music and words, and is worthy not only of repeated listening here, but also of further performances by a wide range of musicians. While the album ventures into some darkly shaded personal life-history corners, the last track, Waltz, is full of good-natured sonic humour. That humour was also a signature of the Robert Minden Ensemble, the precursor of the Minden-Hallett duo. Waltz appears to have become a staple of the duo’s performances: I heard it to hilarious effect at their 2014 Musideum concert in Toronto during their residency at the Desert Fish Studios. Some of those takes ended up on this album. As in other songs on What Is Your Name, blown bottles provide Waltz’s main tune and also its harmony. Hallett’s airy, flexible voice provides a broken triadic vocalise. Various metal, glass, porcelain, string, a vintage telephone and even poured water sounds are added to this, creating a sonic randomness which increasingly encourages the two performers to break out in giggles and then in shear laughter. We’re left with the charming sound of Hallett’s sigh as the final word. I can’t help smiling too.